[Danbury, Conn., Oct. 16, 2018] — The Holiday Inn Express & Suites Wilmington – University Center in North Carolina has recently completed an extensive renovation. 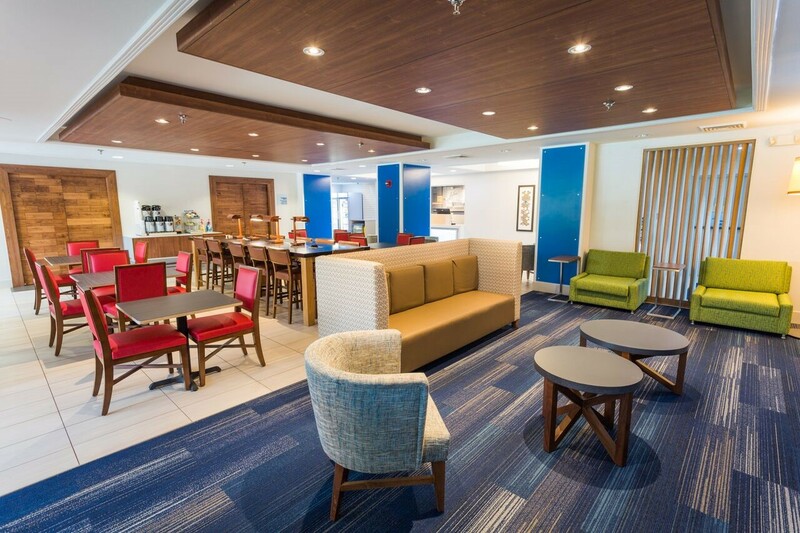 The 131-room hotel, located at 160 Van Campen Blvd., revamped its interior and exterior to reflect the InterContinental Hotels Group (IHG) Formula Blue™ design. Owned and operated by Meyer Jabara Hotels (MJH), the re-design encompasses the porte-cochere, main entrance, lobby, front desk, guest bathrooms, meeting spaces (including a ballroom, boardroom and two function rooms), breakfast area with newly added Sweetshop Marketplace, fitness center and outdoor swimming pool and patio area. Since MJH purchased the property in June 2017, the hotel has improved its ranking on TripAdvisor by 17 positions, and it is now ranked among the Top 8 hotels in the greater Wilmington area. “Guests staying at the new Holiday Inn Express & Suites Wilmington will be pleasantly surprised from the moment they pull into the parking lot,” said Eric Churchill, MJH senior vice president of operations. “Not only does our building look amazing inside and out, but since Meyer Jabara hotels took ownership, the operating principles are exceptional too. The level of service that has been instilled in our staff is second to none. MJ is all about creating a memorable guest experience that guarantees guests will want to return again and again. Renovation to the Holiday Inn Express & Suites Wilmington began March 3rd and was completed August 6th. Although Wilmington was severely impacted by Hurricane Florence in September, the property was unscathed. ES Development & Management Corp. of Boston served as the general contractor; Compass Development Services LLC of Fairfield, Conn., was engaged as the project manager; DiLeonardo of Warwick, Rhode Island, took the lead on design; and Benjamin West of Dallas oversaw FF&E and OS&E procurement. An open house and ribbon cutting ceremony are being planned for October. The Formula Blue™ design prototype selected by the Holiday Inn Express & Suites Wilmington appeals to self-sufficient and independent travelers. It features fresh, energetic and engaging elements, creating a distinctive style that is evident at every touch point of the Holiday Inn Express brand experience. Formula Blue puts sleep quality, simplicity, and ease of maintenance at the center of its concept, which is mandatory for all future renovations and new-build Holiday Inn Express properties. The hotel’s fitness center received new TV-clad equipment. The elevator banks and guest corridors were also updated with new carpet in tones of blue and gray complemented by new vinyl wall covering. When the elevator doors open on each floor guests are greeted with a stylish art-deco floor number for easy wayfinding. Guest bathrooms were gutted to the studs and feature new vanity, tile floor, wall vinyl and back-lit make-up friendly mirrors that female guests love. With headquarters in Danbury, Conn., Meyer Jabara Hotels is an award-winning hospitality company owning, operating or leasing hotels and restaurants in 10 states throughout the eastern portion of the United States. The company was formed in 1977 as Motel Hotel Associates through the partnership of William Meyer, a specialist in real property law, and Richard Jabara, a second-generation hotelier. Their portfolio of hotels includes Marriott, Hilton, Sheraton, Crowne Plaza, Holiday Inn and Hyatt Place brands, as well as several independent hotels. The company culture, referred to as "The Journey," is considered by Meyer Jabara Hotels to be their strongest competitive advantage because it challenges and encourages each team to create special relationships, or heart connections, with the key stakeholders: business partners, associates and customers. For more information on Meyer Jabara Hotels, visit www.meyerjabarahotels.com. IHG® (InterContinental Hotels Group) [LON:IHG, NYSE:IHG (ADRs)] is a global organization with a broad portfolio of hotel brands, including InterContinental® Hotels & Resorts, Kimpton® Hotels & Restaurants, Hotel Indigo®, EVEN® Hotels, HUALUXE® Hotels and Resorts, Crowne Plaza® Hotels & Resorts, Holiday Inn®, Holiday Inn Express®, Holiday Inn Club Vacations®, Holiday Inn Resort®, avid™ hotels, Staybridge Suites® and Candlewood Suites®. IHG franchises, leases, manages or owns nearly 5,300 hotels and more than 785,000 guest rooms in almost 100 countries, with more than 1,500 hotels in its development pipeline. IHG also manages IHG® Rewards Club, our global loyalty program, which has more than 100 million enrolled members. InterContinental Hotels Group PLC is the Group’s holding company and is incorporated in Great Britain and registered in England and Wales. More than 350,000 people work across IHG’s hotels and corporate offices globally. Visit http://www.ihg.com for hotel information and reservations and http://www.ihgrewardsclub.com for more on IHG Rewards Club. For our latest news, visit: http://www.ihgplc.com/media and follow us on social media at: http://www.twitter.com/ihg, http://www.facebook.com/ihg and http://www.youtube.com/ihgplc. Holiday Inn Express® hotels are modern hotels for value-oriented travelers. Fresh, clean and uncomplicated, Holiday Inn Express hotels offer competitive rates for both business and leisure travelers. Guests Stay Smart® at Holiday Inn Express hotels where they enjoy a free hot Express Start™ breakfast bar with new healthier offerings, free high-speed Internet access and free local phone calls (U.S. and Canada only). There are currently 2,572 Holiday Inn Express hotel locations around the globe. For more information about Holiday Inn Express hotels or to book reservations, visit http://www.holidayinnexpress.com. Find us on Twitter http://www.twitter.com/hiexpress or Facebook http://www.Facebook.com/holidayinnexpress.